Laura Azaria joined LALIVE in 2014. She specializes in international arbitration and litigation. She also regularly advises clients in international commercial transactions. Ms Azaria has extensive experience in contract disputes, with a particular emphasis on infrastructure and construction projects, sales, distribution, joint venture and shareholders agreements, as well as M&A transactions. She has acted as counsel or administrative secretary to arbitral tribunals in numerous arbitration proceedings, both ad hoc and administered. She also represents parties in arbitration-related court proceedings, especially relating to the setting aside of international awards before the Swiss Federal Supreme Court. Ms Azaria is a member of several professional associations, including the Geneva Bar Association, the Swiss Federation of Lawyers, the Swiss Arbitration Association (ASA), ASA Below 40, and the International Law Association (ILA). Before joining LALIVE, Ms Azaria worked at Eversheds Ltd in Geneva, first as trainee and then as an associate (2010-2013). 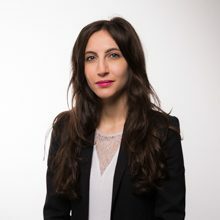 Ms Azaria holds an LL.M from Columbia Law School (Harlan Fiske Stone Scholar Honors, 2013-2014), as well as a Master of Economic Law (2010) and a Certificate of Advanced Studies in Legal Professions (2011) from the University of Geneva. She has also worked as a research assistant at Columbia Law School with Professor George Bermann (2013-2014).